Not long after wowing us with the X-T2 and X-Pro2, and then squeezing much of this top functionality into the more affordable X-T20, Fujifilm has strengthened its X-E line with its fourth member, the X-E3. The X-E line has been considered favourably among enthusiasts, particularly as much of the tech inside comes straight from the X-Pro and X-T lines, and fitted into a more affordable body. 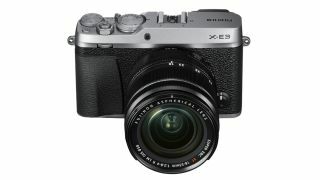 The X-E3 appears to continue that same formula; just as with the co-flagship X-Pro2 and X-T2, the model gets a 24.3MP sensor based on Fujifilm's X-Trans CMOS III technology, together with an X-Processor Pro engine and the company's ever-popular Film Simulation options. 4K UHD video recording also makes its way to the X-E line for the first time, although you can also record in Full HD if you don't need that hefty resolution. There's also a mic port for the benefit of those wishing to improve audio quality. The long-standing Wi-Fi option is now joined by Low Energy Bluetooth – a first for an X-series camera. This allows users to transfer images to their smart devices without consuming too much power, which is potentially very useful if you're out shooting for extended periods. Fujifilm has also gifted the camera the same Focus Lever that we've seen on previous X-series models, which allows the focus point to be shifted around the frame easily. Autofocus tracking performance is also now said to be improved, and while the camera's rear screen can't tilt away from the body as it can on the X-T20 and X-T2, you do now gain touch functionality. There's good news if you want to get your hands on a Fuji X-E3 quickly – the X-E3 will be released on the 28th September, in both black and silver finishes. Like the previous X-E2S, Fujifilm is planning on making the new model available in both body-only and kit options. The body on its own is set to be released with an RRP of £849 in the UK and $900 in the US. A kit with the Fujinon XF23mm f/2 R WR lens, meanwhile, will retail at £1149/$1150/AU$1,799, while a further kit with the Fujinon XF18-55mm f/2.8-4 R LM OIS lens will cost £1249/$1300 at launch. If you want to get the BLC-XE3 case for the camera you'll have to part with £74.99, while the MHG-XE3 metal hand grip will retail at £119.